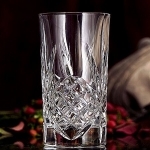 Synonymous with fine dining, crystal wine glasses have come to be associated with the finer things in life. Not only are they better looking and clearer than normal glasses but they also reflect light in a dazzling way. If you are looking for wine glasses even the wine connoisseurs will tell you that crystal glasses are your best choice not only because they are aesthetically appealing but also because they fulfill certain important functions when it comes to wine tasting. Wine is usually assessed by three aspects; its taste, color and smell and the shape of the glass as well as its style will have an impact on all three of these aspects. Clear crystal glass best shows the color of the wine in it but this is the wine buffs choice. The wine's smell alters with the shape of the bowl although this change is very small. In most cases only a professional can know the difference. Red wine require a large wide bowl to enable it to breathe thus be able to release the bold aromas it is well known for. The more delicate white wine requires a smaller and tighter bowl to focus the bouquet. Having a tall stem on the glass stops the hand from warming the wine thus retaining its cool temperature. When it comes to sparkling wine and some champagnes, a flute glass will show the effervescence and maintain the bubbles for a much longer period. The shape of the glass itself also affects a wine's taste. This is because the wine is shifted to different taste zones depending on what type of glass shape you have. Wider rimmed glasses let the person sip the wine with their heads down while the narrower rimmed glasses force a person to tilt their head back. These two different types of rims force a change on the areas of the palate where the alcohol can be tasted. The basic rules can be summarized as; Red wines require larger glasses with more rounded bowls to allow the wine to breathe and make it bolder, White wines as well as Rose wines require smaller bowls which keep it cool but need to be topped up more frequently and Sparkling wines and Champagnes require flute glasses that keep the bubbles for long periods. These rules are observed by the professional sommeliers and connoisseurs to determine the quality of wine and you too can use these techniques to have a more pleasurable wine drinking experience. After all if the exerts do it why shouldn't you? You can find wine glasses cheap in many online stores as well as physical shops and depending on your preferences and needs you should choose a set that will work best for you. As you have seen, not just any of the crystal wine glasses will suit your needs so you need to think about what you will buy carefully. In the end there are crystal wine glasses to suit any taste or preference that will definitely increase the pleasure of wine drinking.